Once you know the "seed pattern" for drawing a labyrinth it is easy to lay it out on the ground and use the pattern to construct a labyrinth. Stone makes a good building material but many materials could be used to provide the outline of the labyrinth. The seed pattern with proper dimensions is laid out on the ground with the building material. Paths are then added one at a time until completion. An area of ground that measures about 45 feet by 45 feet is needed for paths that are 36 inches wide. The amount of actual space required depends upon how wide you want the paths to be. Eighteen to thirty inch paths work well. The paths need to be wide enough to allow people going in opposite directions on the path to pass each other but not so wide as to avoid each other. 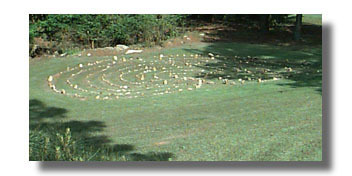 Below is a labyrinth of stone with paths 30 inches wide. The time needed to build a labyrinth depends upon preparation and the number of people available. Recently, I laid out the basic pattern in about twenty minutes and with a group of 15 people participating in a labyrinth workshop we moved three tons of stone and completed the labyrinth in another 45 minutes. With preparation and enough help construction is quick. Ample time is then available to walk, and share the labyrinth experience. Labyrinth completed with group in 45 Minutes.